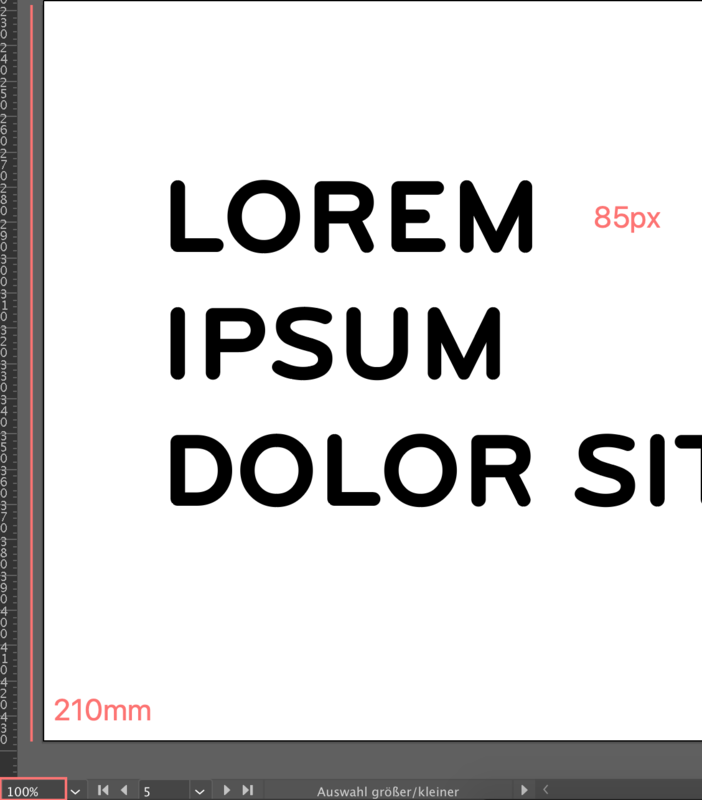 I am currently working on a brand book in Illustrator for a client and I have issues with the sizes (font size, resolution, etc.). What document settings do I have to use on my retina Macbook to make this document correct for all displays? I created a Din A4 document and added a 85px Text. The text is so big and the document so small. Why is that? Shouldn't it be Din A4 size, if I view it at 100%? I think I have some issue in general understanding how to work with a retina display. The good news is that it isn't a retina/non-retina issue you are hitting, and you can 'solve' it relatively easily by turning on View > Pixel Preview. The reason for this is that pixels are an abstract measurement in that they rarely relate directly to actual pixels on the screen anymore. By default, Illustrator maps pixels to points, so they will likely appear bigger than they should. Switching to pixel preview matches them to your computer's default resolution. ISO 216 specifies international standard (ISO) paper sizes used in most countries in the world today... The standard defines the "A" and "B" series of paper sizes, including A4, the most commonly available paper size worldwide. In digital imaging, a pixel or picture element is a physical point in a raster image, or the smallest addressable element in an all points addressable display device; so it is the smallest controllable element of a picture represented on the screen. In these two extracts from the definition of Wikipedia it's clear that one of the measures is for use on paper and the other on device screens. One in millimeters, decimal metric system and the other in pixels, element unit on screen. If you want to send a document to print, you will choose an ISO format, Din A4 for example and you will use points or millimeters to measure the inner elements. While if you want to create a screen document, the format will be defined in pixels and the size of the internal elements as well. Explained in another way, imagine you send a 800 x 600 pixels file to print, do you have any idea what paper size it will be? Retina: nerdy technology invented to sell more high end stuff. Lets see the reflection of that sunset in that drop of water marketing situation. Hence the next incorrect assumption - 'Correct for all displays' - nothing works perfectly on every device. Not the answer you're looking for? Browse other questions tagged adobe-illustrator resolution retina or ask your own question. What is the retina and non-retina resolution of iPhone5 in pixels? Email signature hell--How to include a logo image and have it stay sharp? Saving image files with maximum compatibility for different displays?